The Astra is built in Belgium for the US market. DETROIT -- General Motors will not sell the 2009 Saturn Astra compact car in the United States, a Saturn spokesman said today. GM will resume sales of the Astra in late summer or early fall as a 2010 model. The Saturn Astra is based on the Opel/Vauxhall Astra and is built in GMs plant in Antwerp, Belgium. The Opel/Vauxhall Astra continues in production. 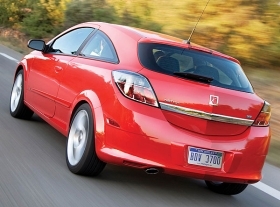 GM will sell the 2009 Saturn Astra in Canada. As of Jan. 1, Saturn had a 139-day supply of the Astra. Janisse says because the car comes with few option packages, the Astra is an easy vehicle for dealers to swap. GM launched the Saturn Astra in January 2008. Through December, 11,968 Astras were sold in the United States. Janisse blamed slow Astra sales on the weak dollar compared with the euro, Saturn placing more marketing dollars behind the Aura sedan and Vue crossover, plus the general industry slowdown. Saturn is unlikely to offer any new incentives for the 2008 Astra, Janisse says, because GM would lose money when factoring in the exchange rate.